In the United Kingdom there are number of highly infectious and potentially fatal diseases which can affect our pet cats. There are no specific treatments for these diseases and, as vets, we can only provide supportive care; sadly this means affected patients may die. The simple and effective way to prevent against these diseases is by vaccination. A primary course followed by regular booster vaccinations is vital to protect your pet cat against these diseases. For more information about the vaccinations required for pet passports, click here. Why does my cat need regular booster vaccinations throughout life? The protection given by the primary vaccination course is not lifelong and the immunity wears off. Adequate antibody levels should be maintained at the level necessary to fight infection should it arise. If a patient has missed its annual booster by greater than eighteen months it will be safer to have the primary vaccination course repeated to ensure adequate protection. In addition to the administration of the vaccine the veterinary surgeon will give your pet a thorough clinical examination. The teeth will be examined and, if necessary, advice given about methods to improve dental hygiene. Eyes, ears, skin and lymph nodes will also be examined or palpated for abnormalities. We will listen to the heart and lungs with a stethoscope, and will palpate the abdominal organs to feel for any abnormalities. We will discuss parasite prevention strategies with you and will answer any questions or perform additional examinations or tasks that may be necessary to optimise the health of your pet. It is very important to ascertain that your pet is healthy prior to the administration of a vaccine. Which diseases can my cat be vaccinated against? Before the development of an effective vaccination, this disease was a common cause of death, particularly in kittens and young cats. It causes severe vomiting and diarrhoea leading to fatal dehydration within two to three days of infection. It is a viral disease which is spread in cat faeces and can survive in the environment for long periods of time. Protection against the disease is provided by a primary vaccination course and then booster vaccinations every 12 months. Cat flu is still a very common condition in populations of unvaccinated cats. The viruses are passed by direct contact between cats but can also be transmitted on clothing. These viruses cause respiratory disease characterised by sneezing, runny noses and eyes and, in some cases, mouth and eye ulcers develop. Fortunately the disease is rarely fatal and often resolves with supportive treatments and nursing care. Young cats, elderly cats and cats with other diseases tend to be affected more severely and can die. Once infected the individual will carry the virus, often on a permanent basis, and potentially transmit it to any cat they meet. Some of these carrier cats may be symptom free but others can suffer recurrent or persistent runny noses, mouth ulcers, gum inflammation or eye ulceration. Protection against the disease is provided by a primary vaccination course and then booster vaccinations every 12 months. All cats should be vaccinated against cat flu, even those who do not have access to the outside environment. This is a very important viral disease which is spread by close contact with an infected cat. Any cat going outside is therefore at risk. Once affected the disease is almost always fatal. Treatment can only help to control the symptoms not cure them. The disease destroys the cat’s immune system and can cause cancerous growths. Protection against the disease is provided by a primary vaccination course and then booster vaccinations every 12 months. It is possible to vaccinate against rabies, but it is not necessary for patients who do not intend to travel outside the UK. If you do wish to travel to Europe with your cat it is necessary to administer a rabies vaccination and to fulfil several other requirements in order that we may issue your cat with a pet passport. This pet passport will allow your cat to travel abroad in Europe and return to the UK without having to spend time in quarantine. In most cases a single rabies vaccination every three years is required, but the frequency may need to be increased depending on the requirements of the countries that you intend to visit. If you do wish to travel to Europe with your cat you must seek advice from your veterinary surgery at least nine months before your intended date of travel to enable time to complete the requirements of the pet passport scheme. When can my cat be vaccinated? 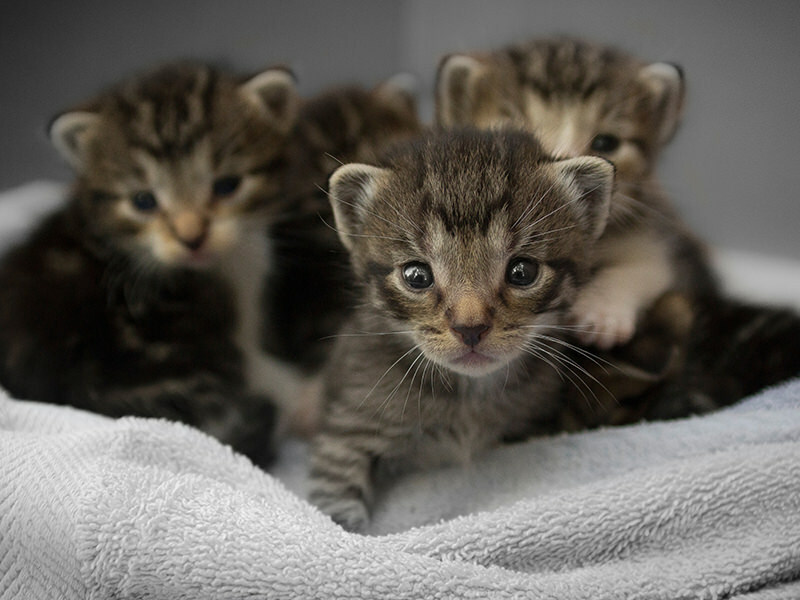 Young kittens are protected from some infectious diseases by antibodies given to them by their mothers. This protection wears off between seven and nine weeks of age. Vaccination will not be of benefit in kittens until the protection from their mothers has waned. We therefore recommend kittens are given their primary vaccination course at nine and twelve weeks of age. If your kitten is older or if you have acquired an adult cat with no previous vaccination history this primary vaccination course can commence at any age. Rabies vaccination and the pet passport scheme can commence from three months of age. How will a vaccination protect my pet? Vaccinations work by showing the body’s immune system the disease in a safe form. This trains the immune system to react quickly and effectively should the body come into contact with this disease in the future. The disease will be eliminated from the body and infection will be prevented. Vaccinations are usually given by an injection underneath the skin; most cats tolerate this very well. The diseases against which we can vaccinate are still seen in unvaccinated populations of cats. It is important that your cat receives a primary vaccination course and then regular annual booster vaccinations to protect against them. Today’s vaccinations are very effective and of high quality however an occasional individual may not get full protection from a vaccination. This is most likely to happen if the pet is unwell or stressed at the time of vaccination and this will prevent the immune system from fully responding to the vaccination. It is important that your pet has a full clinical examination prior to a vaccination and, if illness is suspected, this must be treated and the vaccination delayed until a full recovery is made. Can my pet become unwell as a result of the vaccination? It is common for cats, especially young kittens, to be slightly off colour for one or two days following vaccination and occasionally individuals will be a little tender at the site of the injection. There is some concern that vaccinations could harm the immune system and cause immune mediated disease; this is disease caused when the immune system mistakenly sees healthy body tissue as foreign and attacks it. Evidence for this is purely anecdotal and there is no proof that vaccination causes these diseases. It is important to remember that significant complications following vaccination are extremely rare, and the risk of serious illness and death is much higher from the infectious disease that the vaccines protect against.